Citrullination has received recent attention due to appearance in several diseases such as rheumatoid arthritis (RA), other autoinflammatory disorders, and cancer. It is one of the smallest and lesser-known post-translational modifications (PTMs), as it converts arginine residues into citrulline (a 1 Da change). Despite its size, it has major implications on protein structure & function, as a positively-charged arginine is converted into a neutral residue. Hydrogen bonding is also affected. 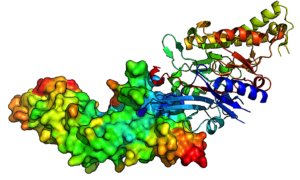 To date, PAD (peptidyl arginine deiminase) enzymes are the only class of proteins known to citrullinate proteins, including myelin basic protein, vimentin, and histones, for example. While PAD enzymes are known to be Ca2+ -activated, little is known about how PAD enzymes are regulated in the cell. Our projects therefore focus on elucidating PAD regulation, and effects of citrullination on protein structure, dynamics, and function. Our hope is that this will lead to better understanding of PAD biology and provide new therapeutics targeted towards PAD enzymes.